madeleine brown handmade: Worlds collide. I think I am forever accursed to work with lovely clients whose lives are so much more exotic than mine. I do my travelling vicariously via my international commissioners these days. This time around I felt far more qualified to fulfill her commission. Aussie-born Kateena met Nigerian-born Zim when they both lived in London, and brought him home to get married last weekend in Brisbane. They entrusted one of my favourite artists, Danielle O'Brien, to create a ink painting of a gumtree and a palmtree, to symbolise their respective origins. 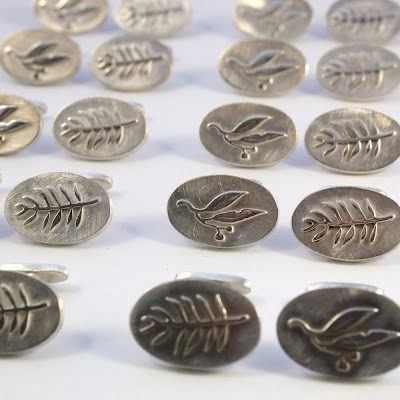 I was asked to make a series of cufflinks and brooches in sterling silver for the families of the wedding party, using Danielle's paintings as inspiration. There is something very satisfying about a neat row of matching jewels, all polished up and ready to go. And what a generous gift for their wedding guests- and a beautiful permanent reminder of two families from opposite sides of the world coming together for the best reason. Big, big congratulations, Kateena and Zim! I hope you had the most beautiful day.